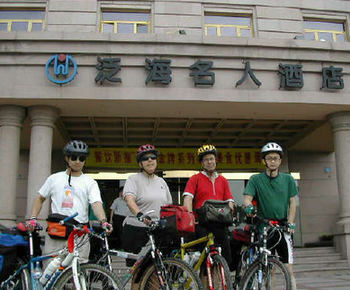 This seven-day bicycle tour begins and ends in Qingdao. This tour is designed as a moderate ride. Average daily cycling mileage will be about 36 miles (57 km). On some days we may use vehicle transport to supplement the cycling to get us to the next destination. Riders will carry their own luggage in their bike panniers. This tour will travel along the Shandong Peninsula from Qingdao to the eastern tip and visit both well-known and little-known sights. This area is largely unexplored by western tourists, so there is little information of "attractions" along the way. On the first day, the group will meet in Qingdao in the morning and check into the hotel then explore this former German colony by bike and include stops at Huashilou, the former German governor’s residence that looks like a German palace. Other options include the beaches, a Catholic Church and possibly the Qingdao brewery. On the second day, cycling east along the coast with our gear out of Qingdao, we will visit the Qingdao Bird Nature Reserve and spend the night in the small town of Jiangjia. The following day we will cycle to Xingcun with an opportunity to soak in a hot spring along the way. On the fourth day, we will cycle to the small port city of Rushan with an option for a stop at the Fengcheng (windy city) beach. The next day we will cycle to Wendeng with stops at the Shengshui Taoist Temple and a hot spring. On the sixth day we will cycle along the eastern tip of the Shandong Peninsula through another small port city of Rongcheng ending the day in the small town of Chengshanwei. On the seventh day, we will cycle to the eastern tip of the Shandong Peninsula along a loop road in the morning and then return to Qingdao by motor vehicle. Day 1: Qingdao. Tour Qingdao in the afternoon on bike. Former German colony still has some of the architectural influence as well as the Tsingdao brewery. Includes: (B), (L), (D). Day 2: Jiangjia. Visit the Qingdao Bird Nature Reserve. Includes: (B), (L), (D). Day 3: Xingcun. Visit a hot spring. Includes: (B), (L), (D). Day 4: Rushan. Stop at the Fengcheng beach and visit the Port of Rushan. Includes: (B), (L), (D). Day 5: Wendeng. Stops at Shengshui Taoist Temple and a hot spring. Includes: (B), (L), (D). Day 6: Chengshanwei. Visit the small port city of Rongcheng and cycle coastal roads at the tip of the peninsula. Includes: (B), (L), (D). Day 7: Chengshantou Qingdao. Cycle to the very end of the peninsula in the morning then vehicle transport back to Qingdao. End of tour. Includes: (B), (L). - If you decide to do something on your own, you will be responsible for those costs.